This is actually my second attempt at writing this review. I usually don’t have a problem writing any review, especially for a product like the Kindle Fire that I think is a good product at a good price. The problem with this review, however, extends beyond the product itself. But first, let’s talk about the product up for review. The all-new Kindle Fire HD 8 is the latest from Amazon, designed to be an inexpensive tablet tied to the Amazon eco-system. 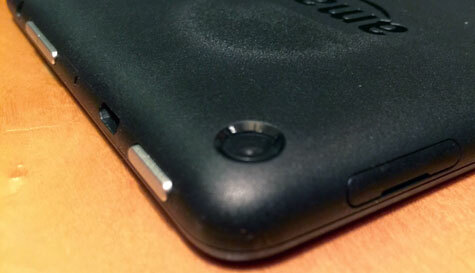 As such, being an Amazon Prime member, while not required, really makes the Kindle Fire family of tablets shine. With the Kindle Fire, you are able to watch as many hours of free Prime videos as you can handle, millions of movies and television shows. It’s enough to satisfy most heavy video cravings, but if you desire more, the popular Netflix app is a quick download away on the Kindle. As for the specs, they are hit and miss. The new Kindle Fire HD 8 runs the same processor as last year’s Fire HD 7 model did, and at 1.5GHz, it’s plenty fast enough for gaming, which is really the only metric you need to test the speed of the Kindle, at least in processing terms. The screen is an 8”, semi-wide screen. Usually when one refers to a wide-screen, they mean a 16.9 aspect ratio screen, but the new Kindle Fire HD 8 is not a real 16.9 aspect screen. It is 1280X800, which again is the same specs as last year’s Fire HD 7 model. Disappointingly, this new Kindle’s screen is 189 ppi, while last years Fire HD 7 had 216 ppi. Is this a deal breaker? Not for most people, but it’s disappointing that a year later, the Kindle Fire HD 8 has either the same, or slightly worse specifications than the year’s before model. Yes, the screen is larger by an inch, but what you gain in size you lose in Pixels-per-Inch. Not a great trade-off. Putting those specs aside, how does the screen actually look? Very good, and much better than other inexpensive tablets in this price point. While it cannot compare to an iPad mini, it simply crushes the iPad in price. For many, that’s enough. Even more disappointing is the camera on the new Fire HD 8. It has a rear facing camera that will shoot 1080p video via its 5 MP camera. The front camera shoots video at 720p. The quality of both video and pictures that the Kindle Fire HD 8 takes is abnormally bad. Cell phones from five years ago took better photos and videos. Amazon would have been wiser to either (a) leave the camera off the Kindle Fire HD 8 completely, or (b) at least put in a decent quality camera and lens. Photos are simply not worth taking with this Kindle Fire. You can buy the new Kindle Fire HD 8 with either 8 or 16GB of internal flash storage. That may be enough for some, but I personally ran into problems with my Fire HD 7 when I completely filled up that space. 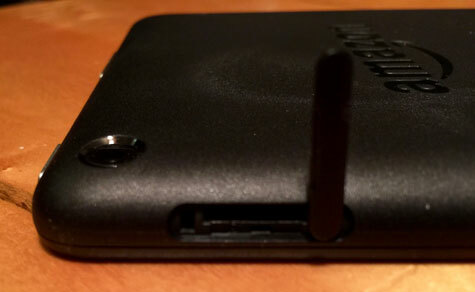 Amazon has given a great work-around to the storage issue by including a micro-SD card slot on the Fire HD 8, allowing the buyer to install up to a 128GB card. A quick look on Amazon shows that you can get a decent 128GB starting at $19.99. While the 16GB Fire HD 8 is $20 more than the 8GB model, there really is no reason to buy it. Get the 8GB version and a micro-SD card for the same price. Reading is very good on the new Kindle, on par with an iPad, Android phone, or iPhone. However, if reading is your primary purpose for looking at a Kindle, you would be better served by purchasing a Kindle Paperwhite. You will get cleaner text that is easier on the eyes, and a battery that lasts a very long time as compared to a Kindle Fire tablet. Charging time on the tablet is good. I ran the Kindle Fire HD 8 completely out of battery, and in three hours, it was completely charged again. Audio for movies or gaming is decent, but not great via the Dual stereo speakers. App selection is hit or miss. It feels like an app ghost town if you compare it to Google’s Play store or Apple’s App Store. Many of the bigger titles are here, but there are many that are not. The biggest omission is the lack of Google apps, meaning no YouTube or Chrome. Why these are not available on the Kindle Fire is a question for either Google or Amazon, but as a buyer, you should be aware that two of the most popular apps in the mobile world are not available on the Kindle Fire. Buying apps on the Kindle Fire is simple, as everything is tied directly to your Amazon account. You can also lock out purchasing apps or in-app purchases via the settings, so you can feel secure by letting young children play with the tablet. Those people interested in Amazon’s Kindle Fire HD products are either those who don’t want an iPad or those who cannot afford one. 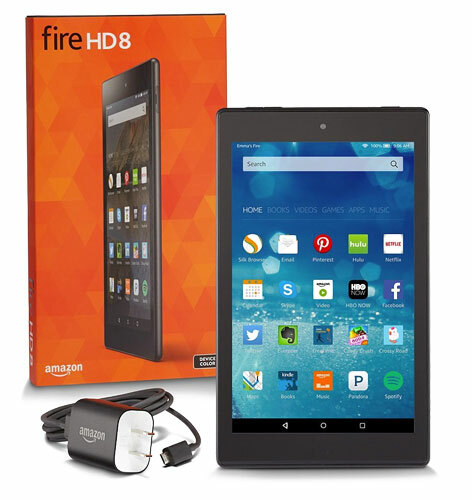 If you don’t want an iPad, but still want a nice Kindle Fire, look to the larger Fire HDX 8.9. ($429) It beats the lower-priced Kindle’s in every aspect. If that’s too large or too pricey and you want a smaller sized screen, than I would suggest the Kindle Fire. The Kindle Fire comes with a 7” screen, which honestly is not as good as the Fire HD 8 screen, but the price more than makes up for it: $49.99. The 7” Fire also has a slightly shower processor (1.3GHz), even less Pixels-per-Inch (171) and a max resolution of 1024 X 600. In specs, no, it’s not as great,. But you can buy three of them, or one of the Fire HD 8. I still like the Amazon Kindle Fire HD 8. On its own merits, it’s a decent successor to last years model in expandability alone, but in almost every other category, it’s either a step back, on par, or just a little better. If you already have last year’s HD 7, wait until next year. If you want a smaller tablet in this form factor that is not expensive, look at the 7” Kindle Fire for a third of the price. And if you want something to read with, look to the Kindle Paperwhite.